An 11-year-old California girl was overcome with emotion after doctors placed an implant that let her hear clearly for the first time. 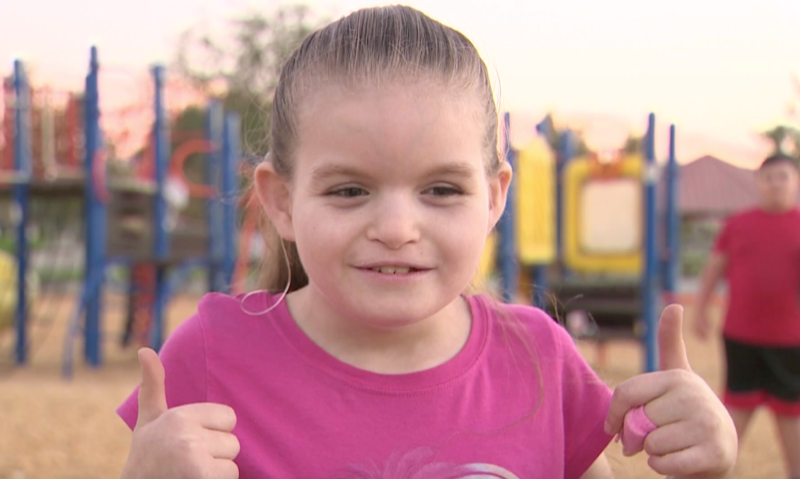 Catalina Arroyo was born with inner-bone hearing loss, and the little she could hear was muffled, CBS Los Angeles reports. This week, when doctors finished attaching the medical device on Catalina, hearing crystal-clear sounds was overwhelming for her. Video from inside the doctor's office showed Catalina break into tears when she could finally interpret sounds and hear her own voice. Before then, her mother said it was like Catalina was trapped inside a booth, trying to listen to voices through a wall. "They said it was the vibrations that she would hear from us," Christina Arroyo told CBS LA. Catalina has spina bifida and other special needs. Doctors once told her mother she would never walk. "She's a miracle," Christina said. Now that she can hear, it should be easier for her to speak – and that's giving her family hope for the future. "She'd be more than what everyone expects from her," her mom said. The best part about the implant so far, according to Catalina, is hearing all of her friends' voices.